For the past 25 years, The New Press, a not-for-profit publisher operated editorially in the public interest, has worked to broaden the audience for books on important social issues, and, in the wake of the 2016 presidential election, the urgency of this mission has grown, according to publisher Ellen Adler. The year 2016 was The New Press’ most successful since its founding, with sales of $6.5 million and two simultaneous bestsellers: The New Jim Crow: Mass Incarceration in the Age of Colorblindness by Michelle Alexander, which has been on the New York Times bestseller list for 211 weeks since its publication in 2010, and Strangers in Their Own Land: Anger and Mourning on the American Right by Arlie Russell Hochschild, a 2016 National Book Award finalist. Co-founded in 1992 by André Schiffrin and Diane Wachtell, who now serves as executive director, The New Press publishes 40 books per year, including many works that, despite their intellectual merits, might be deemed insufficiently profitable by commercial publishers, said Adler. The list, which is mostly nonfiction plus some fiction in translation, is distributed to bookstores by the Perseus Books Group. The two New Press books featured at Winter Institute exemplify one of its key goals as a publisher, Adler added: exposing the work of traditionally underrepresented voices, including immigrants, religious minorities, ethnic and racial minorities, women, the LGBTQ community, and the incarcerated. Both Chokehold: Policing Black Men by Paul Butler, a former federal prosecutor writing about the impact of policing on African American men, and Becoming Ms. Burton: From Prison to Recovery to Leading the Fight for Incarcerated Women by Susan Burton and Cari Lynn received a lot of positive feedback from booksellers, she said. The New Press will work with A New Way of Life Reentry Project, which Burton founded, and other criminal justice affiliated programs to cross-promote Ms. Burton, said Adler. In the past, New Press has partnered with many nonprofits and activist groups, including the National Domestic Workers Alliance for The Age of Dignity: Preparing for the Elder Boom in a Changing America by Ai-jen Poo with Ariane Conrad, and the Roosevelt Institute and the Restaurant Opportunities Center United for The Fight for Fifteen: The Right Wage for a Working America by Service Employees International Union 775 president David Rolf. This May, as part of its 25th anniversary celebration, New Press will publish three books on topics that took center stage during the 2016 presidential election and will likely become more relevant under the Trump administration, she said: feminism and misogyny; social justice and civil disobedience; and family values in the age of Trump. All three books will be released under an accelerated schedule with the tagline “Fearless Books for Perilous Times,” which is also the theme of New Press’ anniversary. The first book, Wolf Whistle Politics: The New Misogyny in Public Life Today, will feature an introduction by Naomi Wolf and will include pieces by Rebecca Traister, Sarah Leonard, Gail Collins, Katha Pollitt, and other female writers. Rules for Resistance: Advice From Around the Globe in the Age of Trump will be co-edited by David Cole and Melanie Wachtell Stinnett and will feature an introduction by Cole, the national legal director of the ACLU. How Do I Explain This to the Kids? Parenting in the Age of Trump will be edited by child psychologist Dr. Ava Siegler. Adler said New Press has also put together a post-election catalog highlighting new and backlist titles that are especially topical right now, including books on social movements and democracy, criminal justice, political science, cultural diversity, education, and the LBGTQ community. During its 25 years, New Press has long been dedicated to diversity and social justice, Adler said. Hundreds of interns from diverse backgrounds have graduated from New Press’ internship program, run out of the publisher’s Manhattan offices, and in 1992 and 2012, the press received accolades from Publishers Weekly as a model of diversity. In addition, The New Press Social Justice Award recognizes the work of social justice activists who hold a belief in the power of books and culture to bring about positive change in the world; the first award in 2010 went to author and activist Alice Walker. The New Press’ books address the problems of a society in transition in a number of ways, including highlighting attempts at reform and innovation in a wide range of fields. Lower Ed: The Troubling Rise of For-Profit Colleges in the New Economy by Tressie McMillan Cottom, which published last month, received a glowing full-page review in the New York Times on March 7, said Adler, and Cottom was recently featured on The Daily Show With Trevor Noah. “Education books are among our bestselling category of books,” she added, including Lies My Teacher Told Me: Things Your American History Textbook Got Wrong by James Loewen in 2008 and the 2006 title Other People’s Children: Cultural Conflict in the Classroom by MacArthur Genius Award recipient Lisa Delpit. On August 1, The New Press will publish Addicted to Reform: A Twelve-Step Program to Rescue Public Education by longtime PBS education correspondent John Merrow. Other upcoming titles that Adler has high hopes for include the novel in translation Black Moses by Alain Mabanckou, translated from the French by Helen Stevenson, on June 6, which was longlisted for this year’s Man Booker International Prize. Hypercapitalism: The Modern Economy, Its Values, and How to Change Them, a critique in cartoon-form of the modern economy by cartoonist Larry Gonick (The Cartoon Guide to Physics) and psychology professor Timothy Kasser, comes out January 2, 2018, and The Least Among Us: Waging the Battle for the Vulnerable by Connecticut Congresswoman Rosa DeLauro will be released June 6. “The Least Among Us makes the argument for the social safety net that we fear is being eroded rapidly. I think it’s a pretty timely book for us and for the world,” Adler said. New Press’ past title lists also include many commercially successful authors, including Marguerite Duras, John Leonard, and Studs Terkel. The latter is the author of Working, Hard Times, and Coming of Age, which are still very significant backlist titles, according to Adler. Other big-selling backlist books include Understanding Power by Noam Chomsky, the abridged teaching edition of Howard Zinn’s A People’s History of the United States, and Swedish crime writer Henning Mankell’s Wallander series. 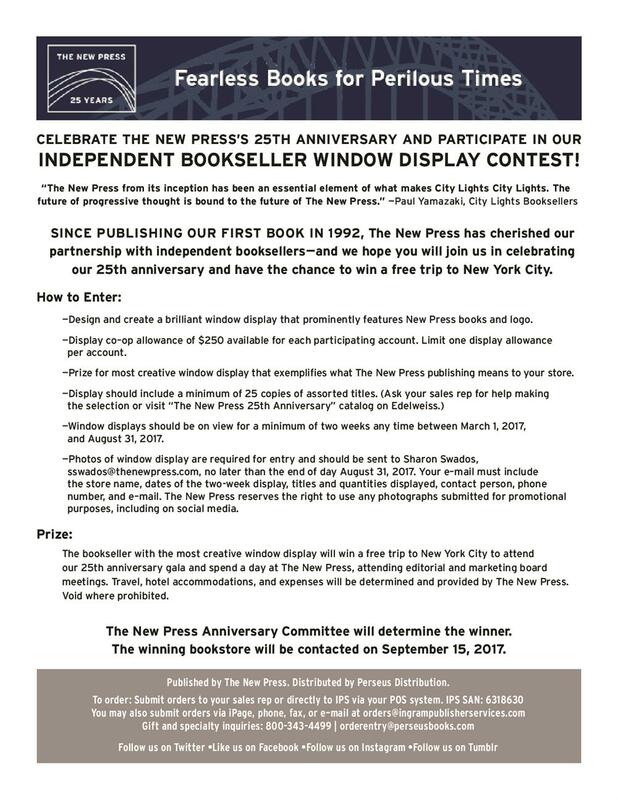 To mark 25 years of publishing, The New Press will be celebrating with booksellers at the fall regional trade shows. The publisher is also inviting stores to take part in the Independent Bookseller Window Display Contest. The bookseller with the most creative window display that exemplifies what The New Press means to their bookstore will win an all-expenses-paid trip to New York City to attend The New Press’ 25th anniversary gala and sit in on editorial and marketing meetings.